Venice sights: View over Piazza San Marco from the Campanile; Mosaics inside St. Mark's Basilica; Houses on Burano; Doge's Palace. 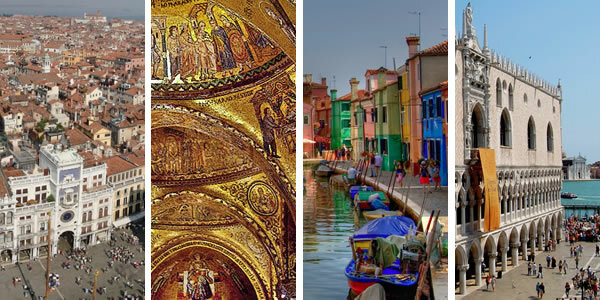 Venice offers everything from the glittering mosaics of St. Mark's Basilica on Piazza San Marco to the Old Master paintings in the Accademia Gallery. There's the romance of a ride in a gondola and the chilling tales of political intrigue, brutal justice, and Casanova's escape from prison you get to hear in the secret backrooms of the Doge's Palace on the "Secret Itineraries" tour. Then there is the festival of Tintorettos in the Scuola Grande di San Rocco, the world-renowned glass factories and medieval churches of Murano, the views from the Campanile, the sumptuous decor of the Ca' d'Oro, the fascinating tours of the Jewish Ghetto, the modern art masterpieces in the Peggy Guggenheim, and, of course, the Grand Canal, perhaps the most glorious—and oddest—main boulevard of any city in the world.